Fine tuning text, adding, removing and reordering pages: when we embarked on this project, tools for altering documents were the furthest thing from our minds. A responsible journalist doesn’t tweak source documents! One of the first papers to embed material using DocumentCloud needed to do just that. Chicago Tribune accompanied their coverage of a troubled foster home with a collection of letters and court orders. Though the documents offered an excellent illustration of the state child services agency’s lax oversight and slipped follow-ups, they were predictably full of personal information about children in the foster care system, individual agency staff names and other personal and identifying details about private individuals that The Trib opted to omit from their reporting. That decision, however, left the news apps team replacing the whole stack of letters multiple times before the package was finally ready to post. A tool, right inside of DocumentCloud, for replacing, removing and reordering the pages of a document would have helped them a lot. When Newshour shared a century old hand-written Mark Twain’s essay, our OCR tools were not nearly up to the task of reading his handwriting. 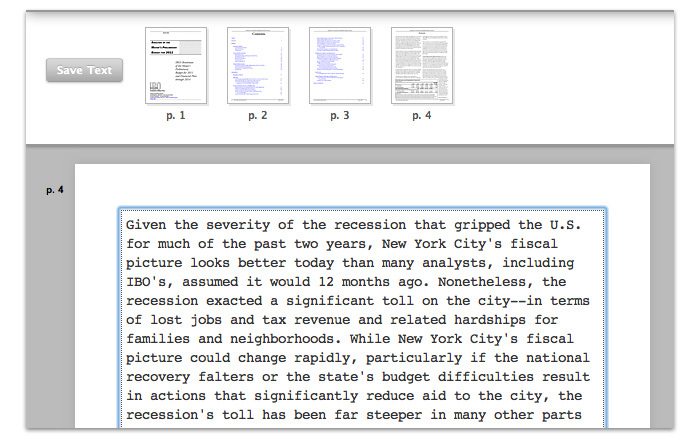 Newshour transcribed the ten page essay by hand and we worked with them to replace the text stored in DocumentCloud and displayed on the embedded letters. By the time that Memphis’ Commercial Appeal wanted to run a lengthy series of handwritten letters from Abdulhakim Mujahid Muhammad, a young Memphis-born man who opened fire on a military recruiting center in Little Rock last summer, we at DocumentCloud were busy supporting nearly 200 newsrooms. Offering to hide the text tab was the best we could do. What Newshour and Commercial Appeal really needed was a tool, right inside of DocumentCloud, with which to edit the text of each document. And so, we’ve assembled what we think is a sweet suite of tools to let you reorder pages, insert new ones, delete old ones and edit the text that will appear in your embedded document. Check out our user guide to see how it all works. We welcome your bugs, feedback, rants, raves and, as ever, your documents. Btw, if your OCR tech ever gets to the point where it can read Mark Twain’s handwriting (I barely can) I’ll assume Skynet has become self-aware and it’s time to start stockpiling food and ammunition.